The fun police have been at work….we have had to remove the pool as even though it’s covered and fenced from anyone getting in with our windbreaks, someone complained to higher authorities that we had a non regulation fence and pool and a child may drown if they happen to managed to get in. Hmmm, we are right next to the beach, and surrounded by farm with water troughs. Enough said. 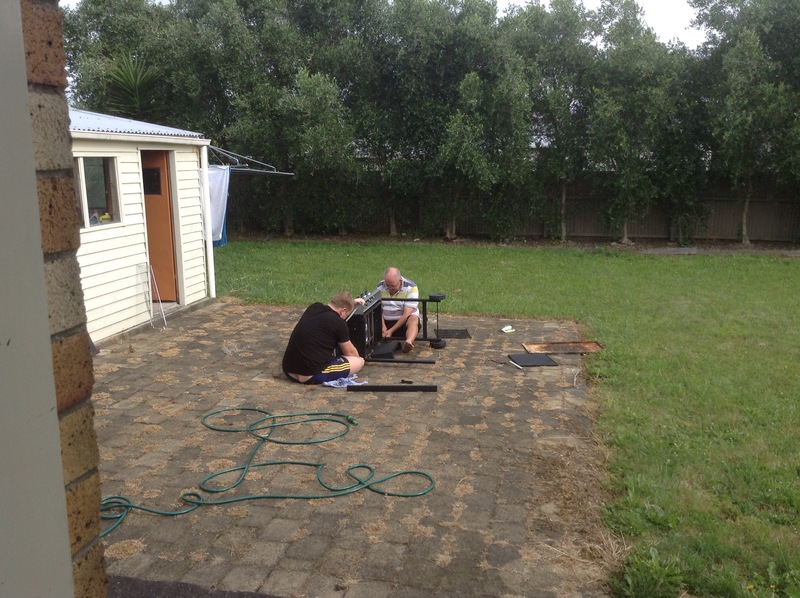 Pool emptied and dismantled and put away. Christmas morning started as relaxed as it should be with a lovely loooooong breakfast. Friends of Steve & Leslie joined us for the festivities and Antony had stayed the night before as well so we had a lovely lively chatter at our breakfast table with Moët the refreshment de jour which seemed fitting to accompany the freshly baked croissants, Camembert, jambon and the other usual bits and pieces. After the guests had left, Leslie and I set about putting together dessert for the Christmas Day meal. 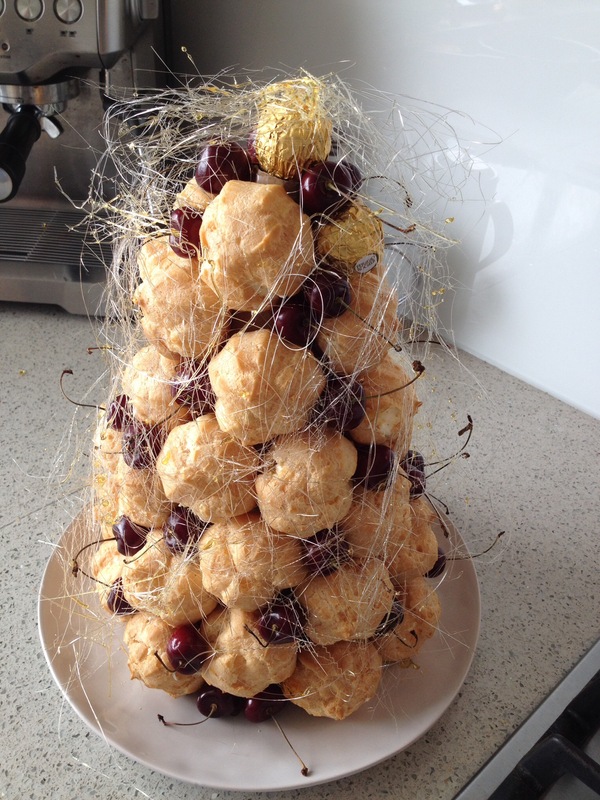 We had made a wreath shaped pavlova the day before so that was just a case of assembling the decoration to be put on later, a fresh berry fruit salad with a lime dressing but our piece de resistance was to be a croquembouche. Whilst Leslie filled the choux buns, I cracked on with making the caramel to “glue” the buns together as well as having a go at making some spun sugar decorations. 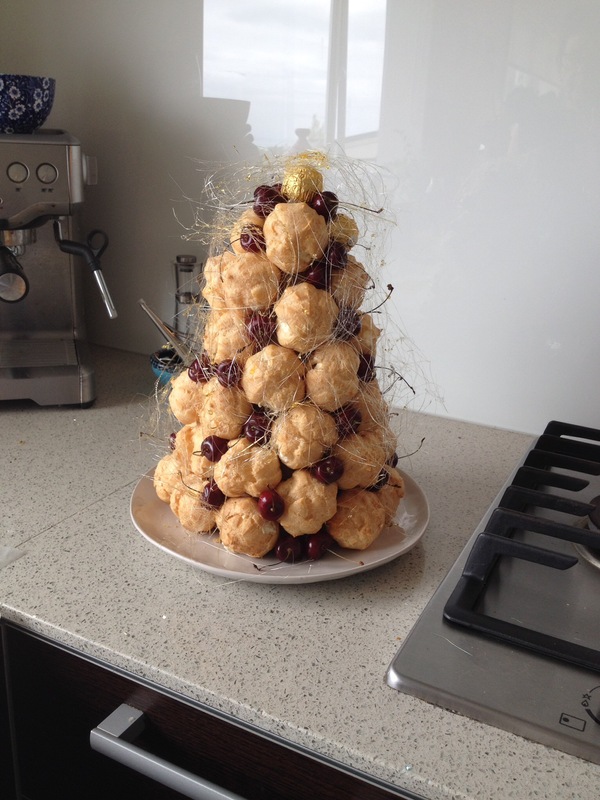 As you can see from the results below, we ended up with a stunning centre piece. The cherries were also dipped into the caramel and placed in between the buns, making it all look very Christmassy and I must say that we had so much fun flicking the caramel around to make the spun sugar threads. 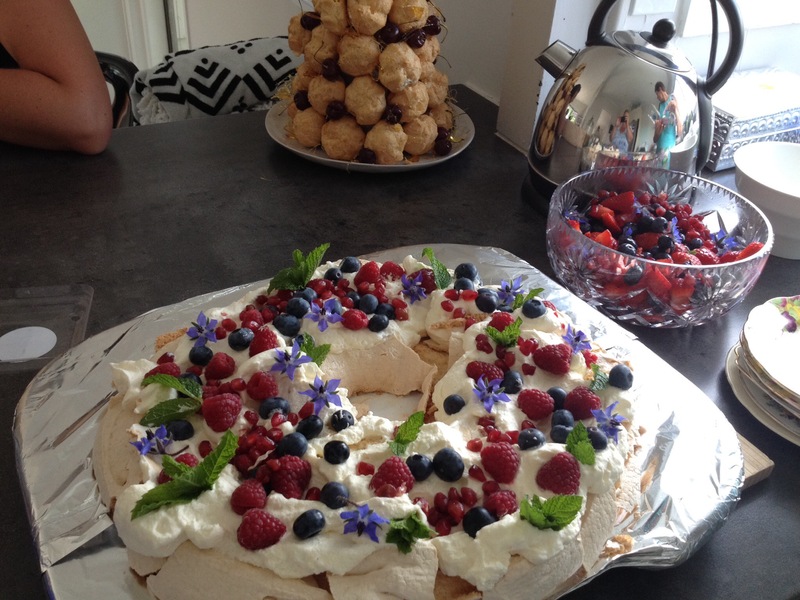 The pavlova wreath in all its glory. Lunch was ably prepared by Fran, Erin and Sarah, with a beautifully cooked turkey making the centrepiece. The rest of the day was enjoyed playing silly but hilariously funny games that Santa had delivered as well as playing our secret Santa, swapping presents with the other adults to great success. A wonderful day. Meri Kirihimete/Merry Christmas/Joyeux Noel/Happy Holidays/ Cheers! Wishing you all a lovely festive season doing whatever it is that floats your boat. Us? Well, we will be heading to my brother Steve and sister-in-law Leslie’s place on Christmas Eve, where Leslie and I will be sorting out the dessert for our Christmas Day feasting. 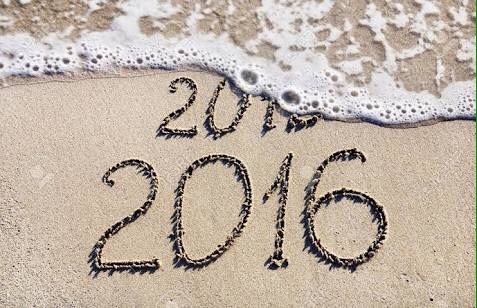 All the best to you and yours, and look forward to catching up with many of you next year. 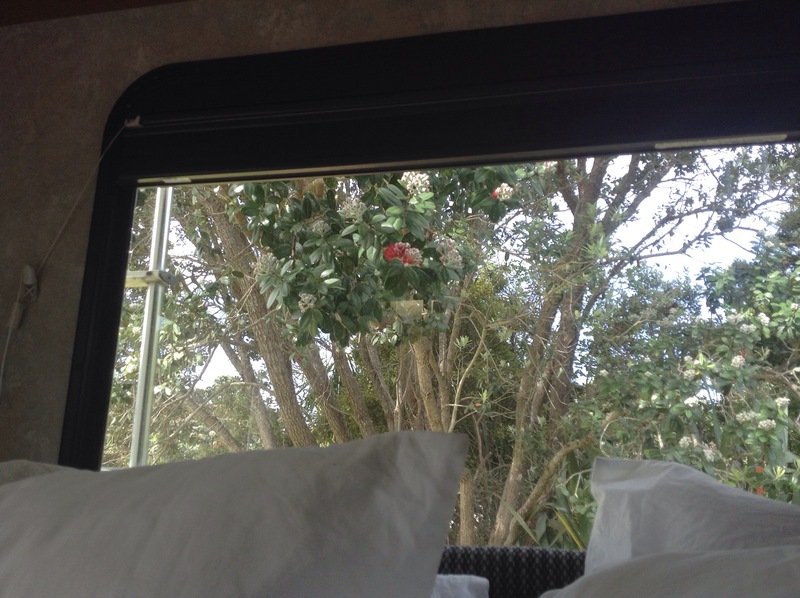 Here’s a picture of the pohutakawa as viewed from my pillow, not a bad sight to wake up to in the mornings! 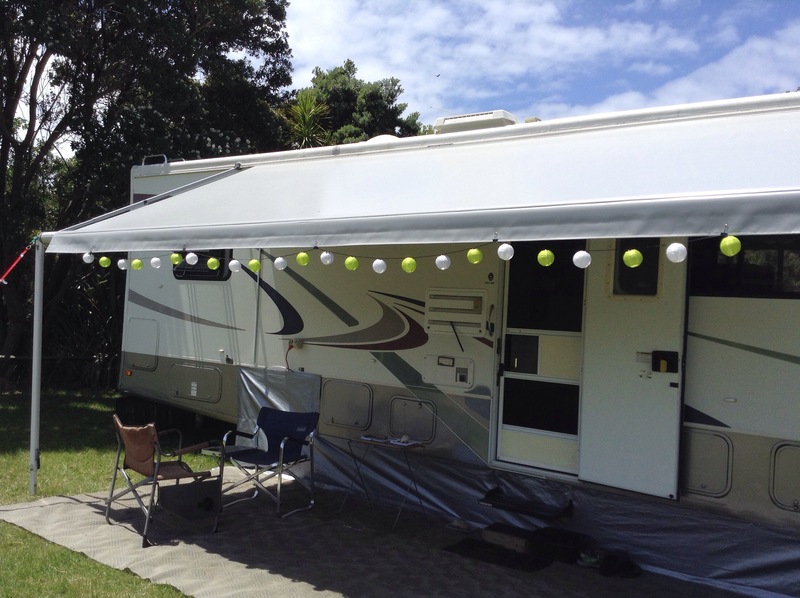 For some time now I have joked with the Rangers here at Shakespear that I was going to get myself a pool, install it at the back of our van in our private bay in the park. Just something smallish, nothing too elaborate so that when I come back from swimming at the beach, I can then chill out in freshwater! Well, no more joking. 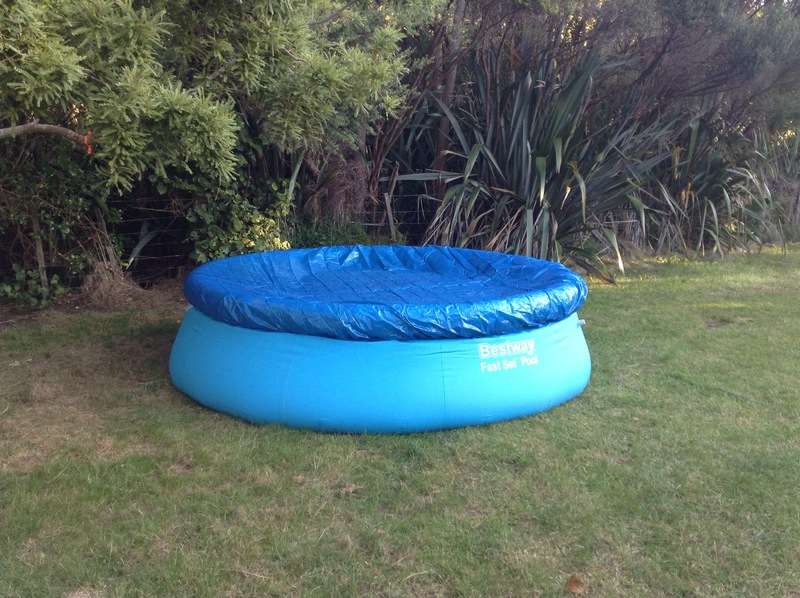 Today, Santa came early and delivered a nice pool……well, OK, I went to the shop and bought it myself. Laying it out ready to fill. 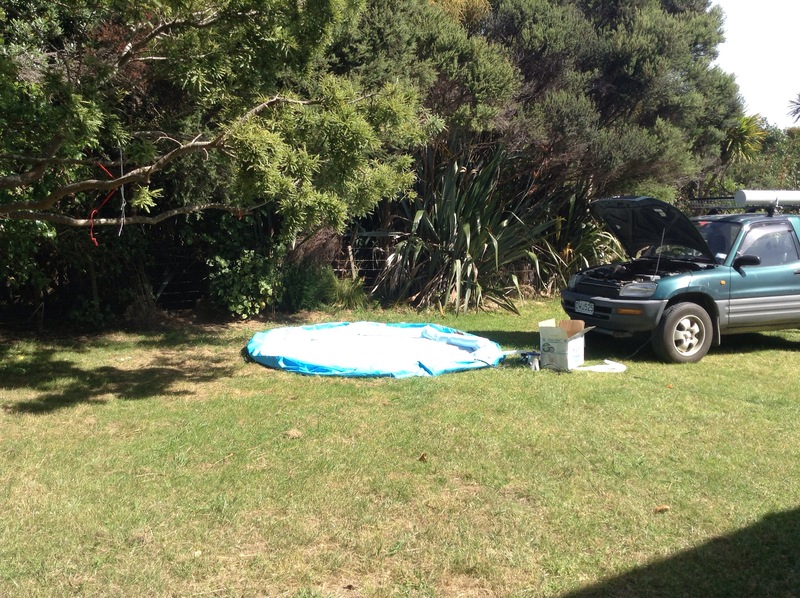 First we had to blow up the outer rim of the pool, to do this we used our small compressor which is charged from the car battery, of course we had left our other compressor that we use to inflate the air bed at Antony’s place. It was taking ages to fill and the compressor was getting rather hot, so I resorted to giving it mouth to mouth! This necessitated running a hose from the tap, actually we had to join a number of hoses together to reach, then it was the long wait to fill. 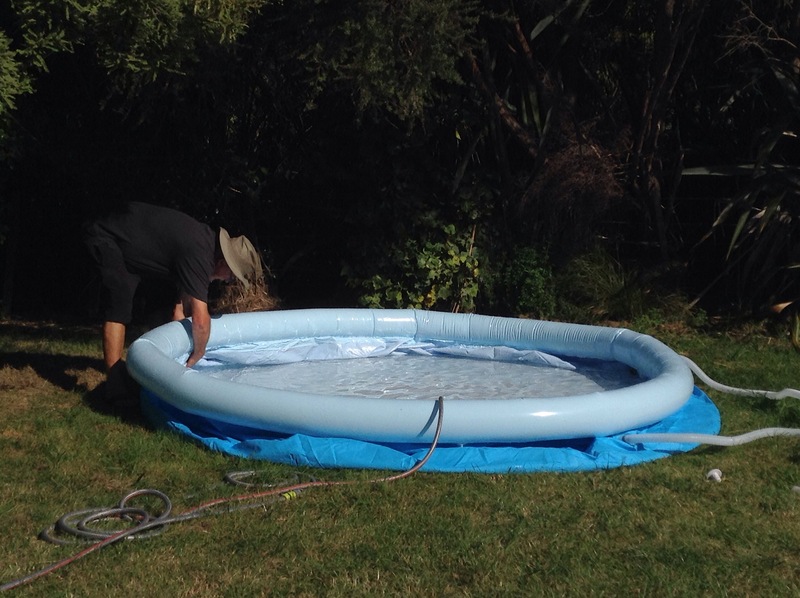 The pool is 10ft diameter and 30inches deep…3.05m by 760cm for those of you who work in metres, it took a while to fill. 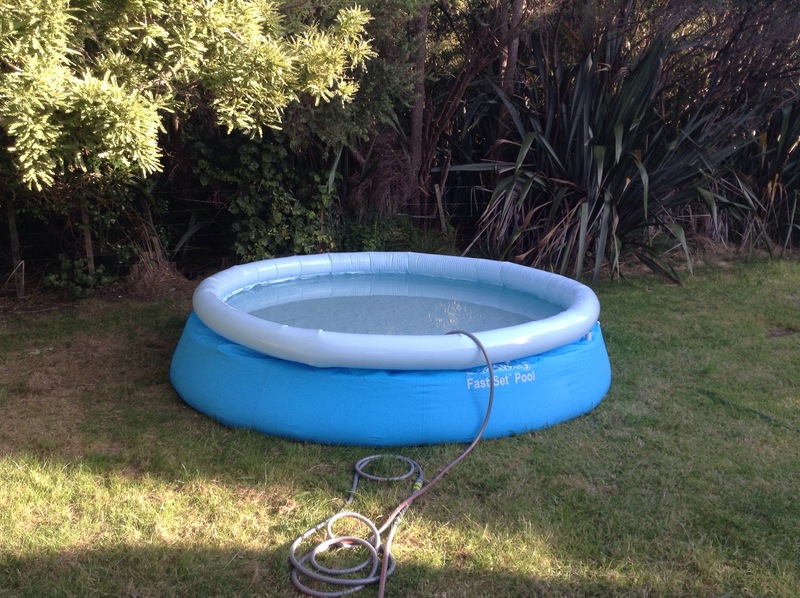 The pool came complete with filtration system and pump so it should be good for the summer. And to make sure it is safe, we also have a cover and as well we have put up our wind breaks at either end of the van so that it is not visible to curious youngsters! Besides, it really is a reservoir for emergency purposes isn’t it? 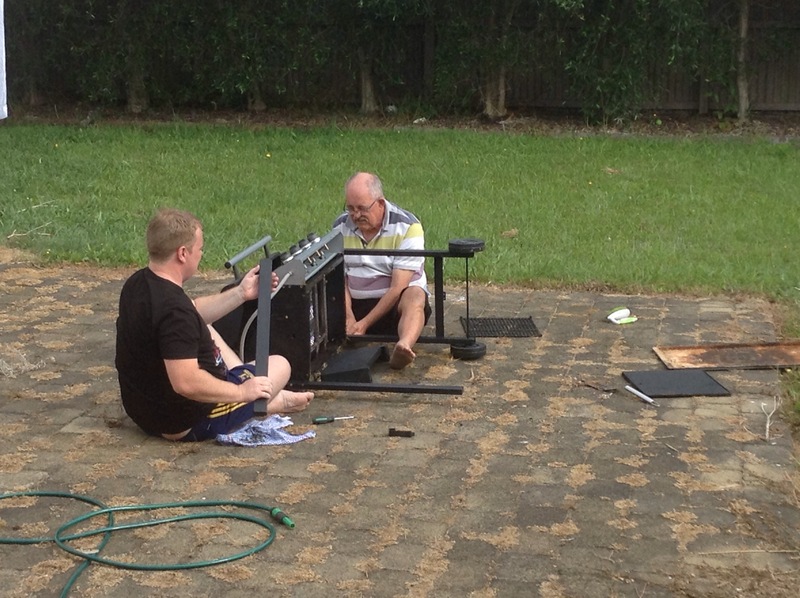 the BBQ comes out of storage, gets cleaned and reassembled! We spent a couple of days at Antony’s earlier this week as Roy had an early morning dentist appointment in Manurewa so instead of getting up at a silly hour and fighting the Auckland early morning traffic from over the other side of the bridge, we took ourselves off to stay with Ants for a night. The BBQ had not been reassembled since Antony had moved earlier in the year, it was time to give it a good clean and put it together. It didn’t take them too long before it was all back together and fired up for its first use of the summer. Oh, and the dead grass on the brick work is my effort with the weed killer from a couple of weeks ago – it worked! The decorations have been given a dust off and the van has been decorated ready for the festive season. 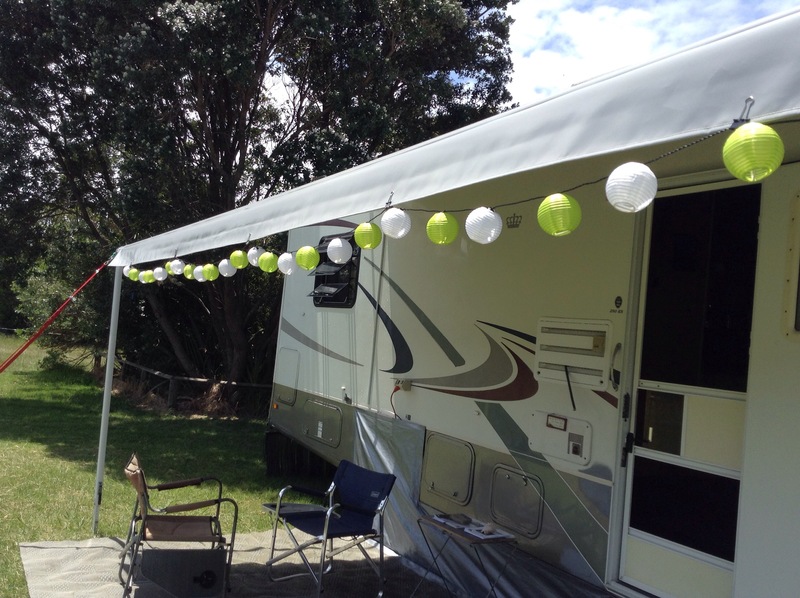 The front the awning has the lanterns and solar lights that I picked up at IKEA on our recent trip to Melbourne. 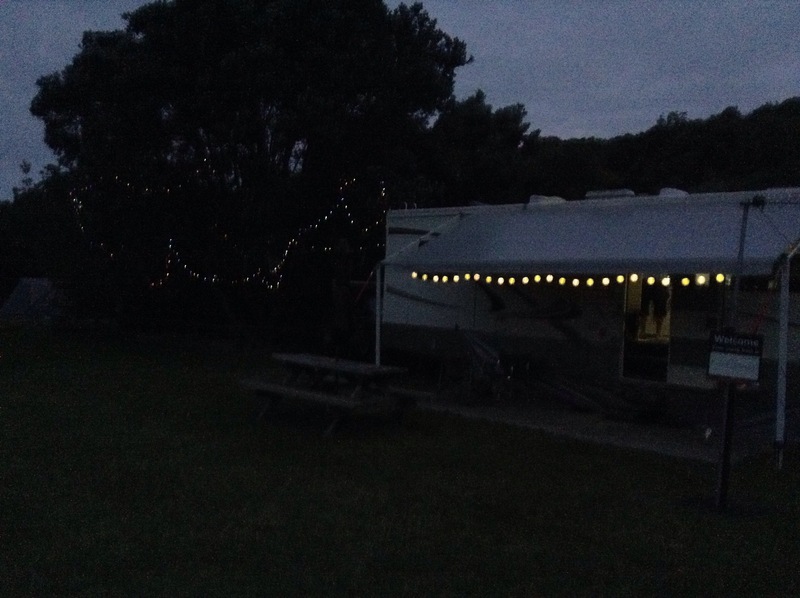 This year we have also filled the pohutakawa tree at the back of the van with multi coloured fairy lights, again, solar powered. At night you can see us for miles!!! Not a very good picture, I know, I will try and get another tomorrow evening! 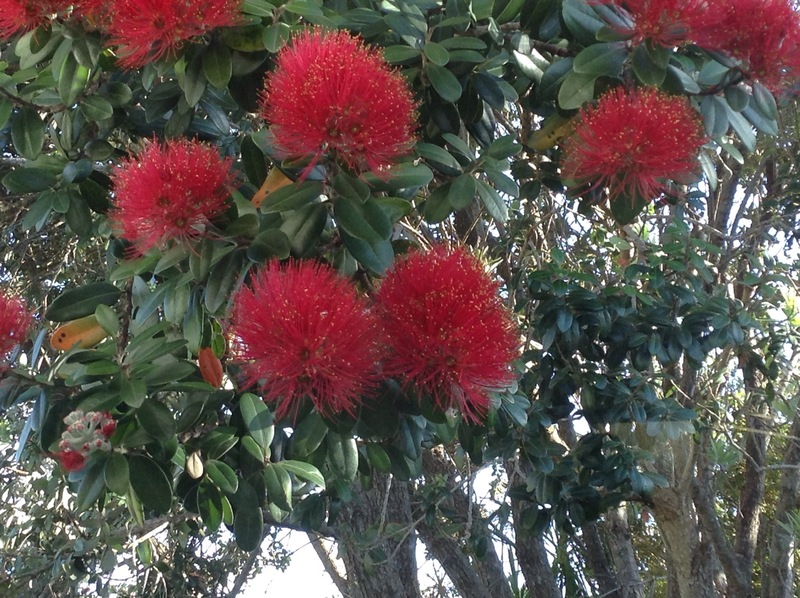 The Pohutakawa at the back of the van has just started to bloom, but the rest of the trees in the park are blossoming well. First flower opening as seen from our bedroom window. We’re famous! 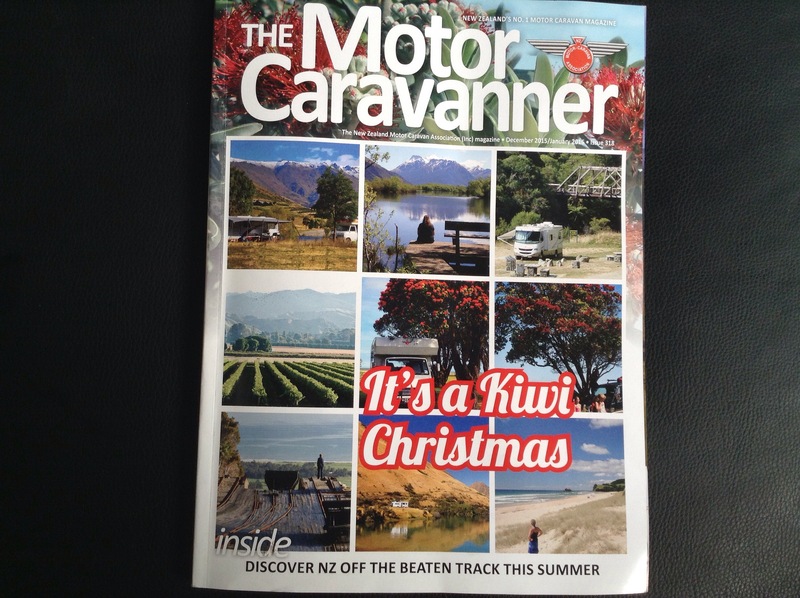 Well, famous among the few thousands that read the NZ Motor Caravan Association magazine and DoC (Department of conservation) web sites. That’s us in the top right hand corner. 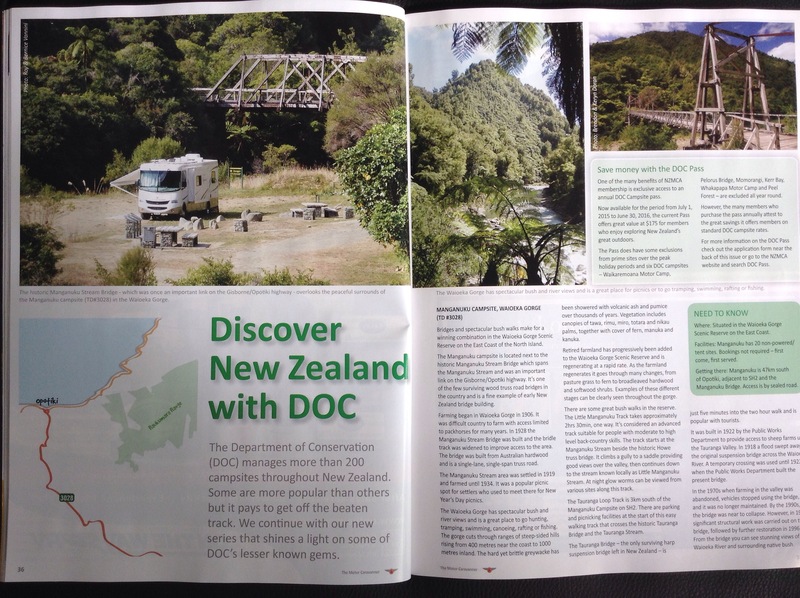 Inside the magazine there is an article in which our photo takes pride of place as the lead photo.